After Travis bought me a Kindle Fire HD for Valentine’s Day (this was interesting to me because we have NEVER given presents on V-day so I’m assuming this was secretly for him…), I immediately started researching options for accessories. 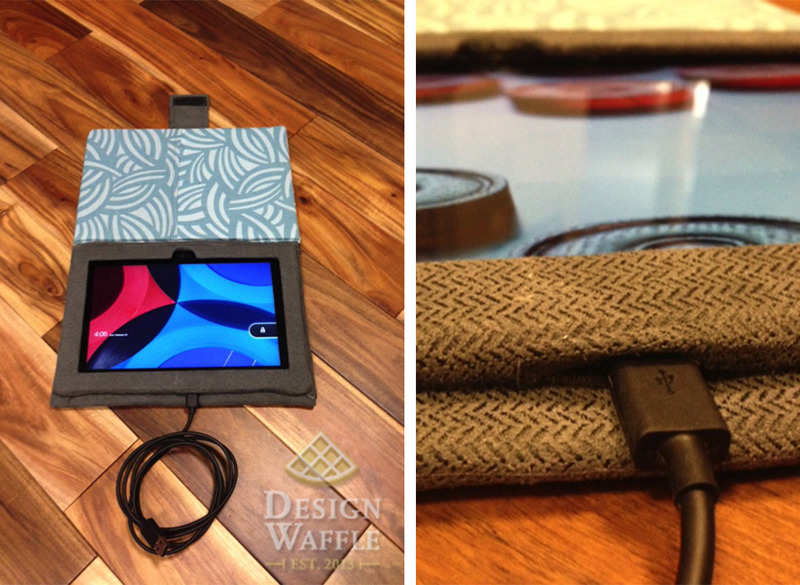 I quickly noticed that all the cute cases were for ipads (as always) and anything that would fit the kindle had the one-size-fits all look and was meant for any tablet. I wanted a cute case, but most of all I wanted it to securely hold the kindle. So this is what I made and I’m going to show you exactly how I did it. I guess you could call this the before shot. This is my favorite lock screen image. I found a few old canvas boards in our guest room just waiting for a new purpose as well as an old college textbook from the garage to use as the hard covers for the case. I rummaged through my scrap fabric bins and pulled out all the contenders. Although I wanted to use my girly fabrics, I was feeling nice and decided to only pull out the gender-neutral options… you’re welcome Travis. FYI: for this project, the photos explain the process a little better than my written explanations. I started by cutting all the boards with a utility knife overtop of a self-healing mat. I used a stainless steel ruler to make nice straight cuts. Don’t bother with a wooden or aluminum ruler. You’ll end up ruining it. 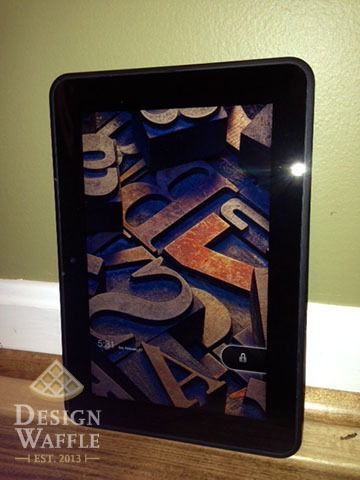 The frame that goes on the face of the Kindle was made from the textbook and it’s exactly the size of the tablet. 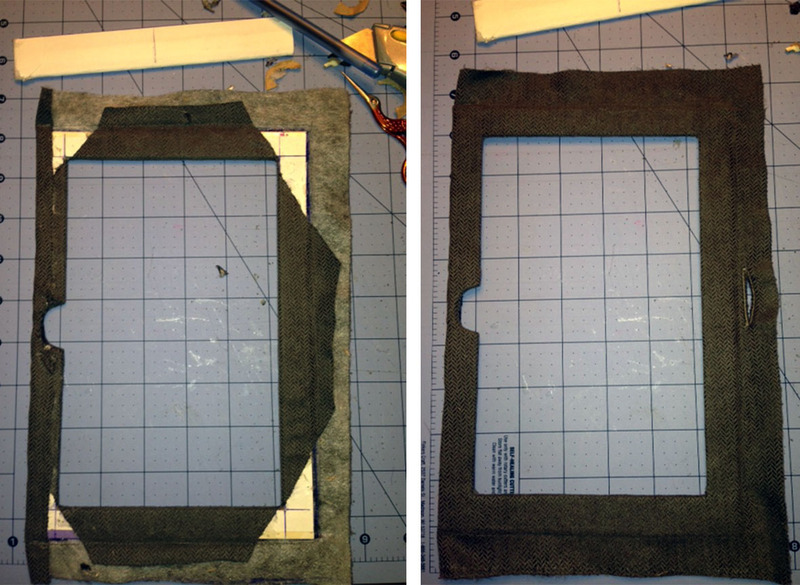 I cut the window to be about 1/4″ from the actual screen and cut out a spot for the camera. The front and back of the case were made from the canvas boards and they’re about 1/4″ larger (on all sides) than the frame. I wasn’t sure if I wanted a hard spine at this point so I went ahead and cut a piece just in case. I ended up not using it. I hot glued the frame to a piece of fabric on the outside edge so that it didn’t dry with a visible bump on the face of the frame. 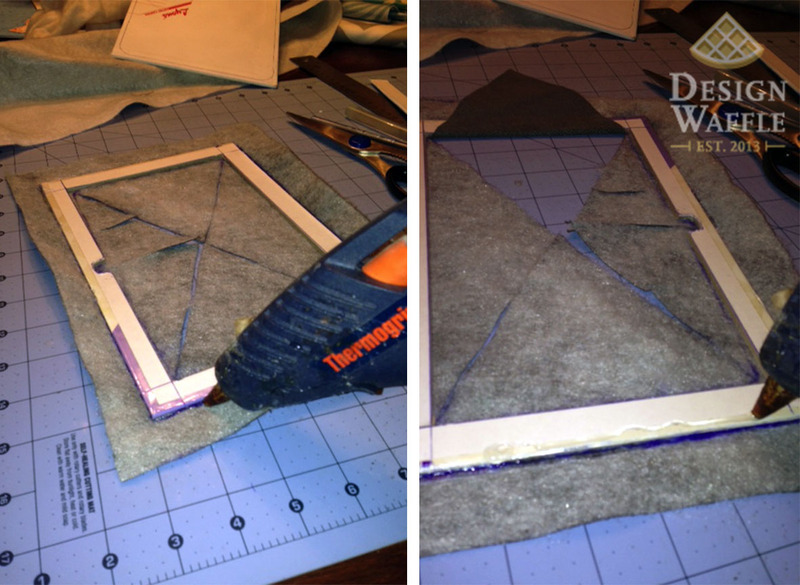 Then I cut the fabric to wrap around the frame and I glued it in place. After all of the flaps were glued down I sewed all the way around the frame to be sure they were secure. I used a zipper foot on my sewing machine so that I could get close to the edge. I sewed a button hole on the side where the charging port is located so I won’t have to remove the Kindle during charging. In the photos below, you can see how the front and back of the frame ended up. 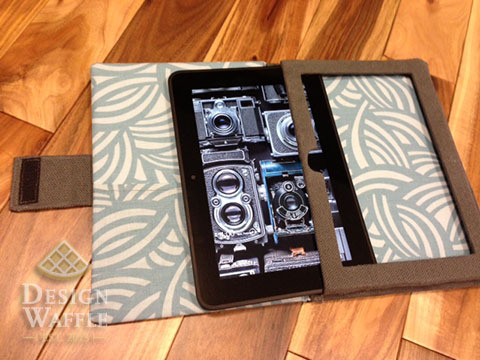 I wrapped the left side of the frame completely since the Kindle will slide in through this side (refer to finished photos at the end of this post). 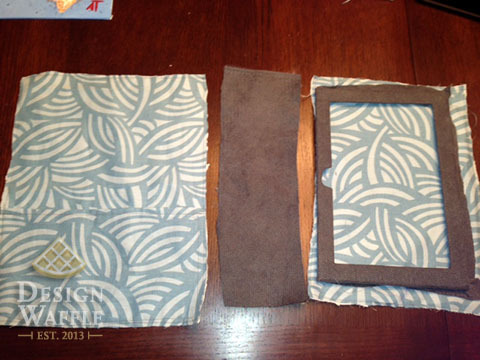 Next I pinned the frame to the fabric that will show when the Kindle isn’t in the case. 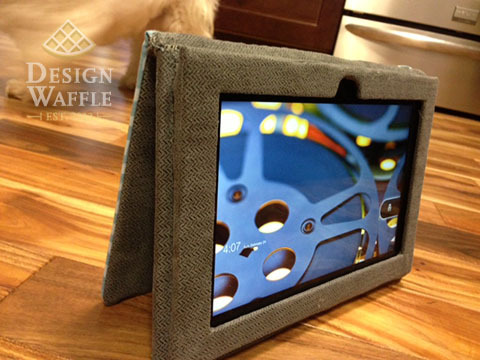 It’s a good idea to have your Kindle on hand for the entire process of making the case so that you can keep checking that everything is fitting properly. 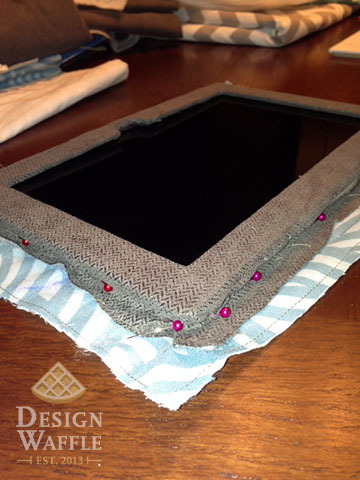 I made it really snug and pinned very close to the Kindle and then pulled out the tablet and sewed along the pinned line with a zipper foot on my sewing machine. I prepared and laid out the interior pieces of the case: the inside panel of the front cover (I sewed a pocket on to hold the charging cord), the interior spine piece (there is also a separate piece just like this for the exterior of the case), and the inside of the back panel (where the Kindle slides into). 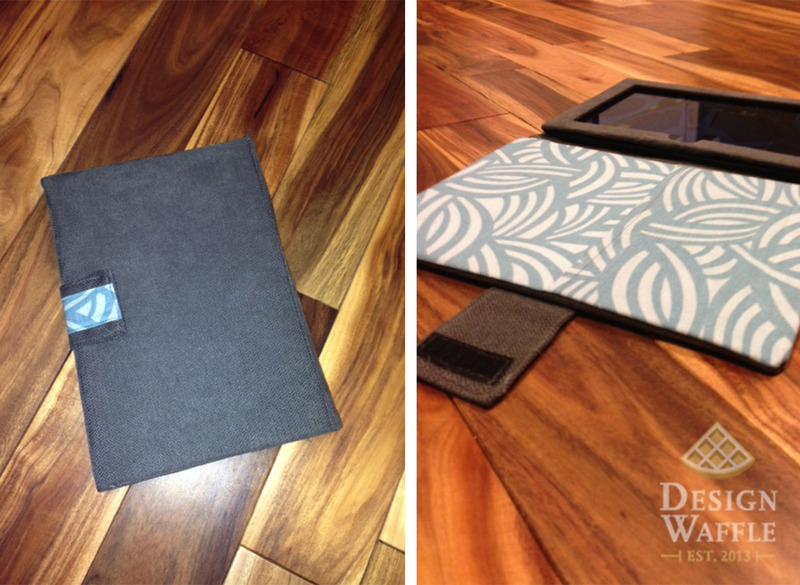 I sewed together the front panel and the panel with the pocket to make up the front cover. I made a strap with some velcro and sewed it in place. I slipped in the board I cut earlier and pinned tightly and sewed it in place. 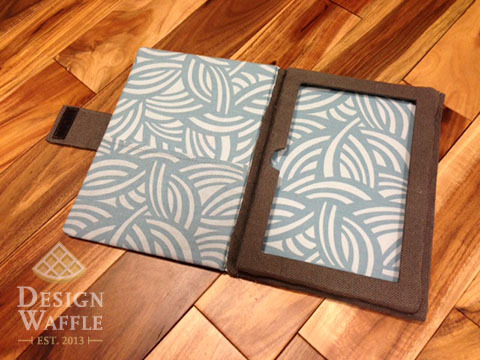 Next I moved onto the back cover by sewing the back piece of fabric to the inside panel (where the Kindle will be placed). I made sure to place the board in place so that I could pin and sew snuggly around it. This is shown in the photo on the left below. I then trimmed most of the excess fabric and wrapped all the edges up and hot glued them in place. I don’t usually use hot glue in situations like this but I used it sparingly so that it would hold the flaps in place. Then, by hand, I sewed the flaps down. 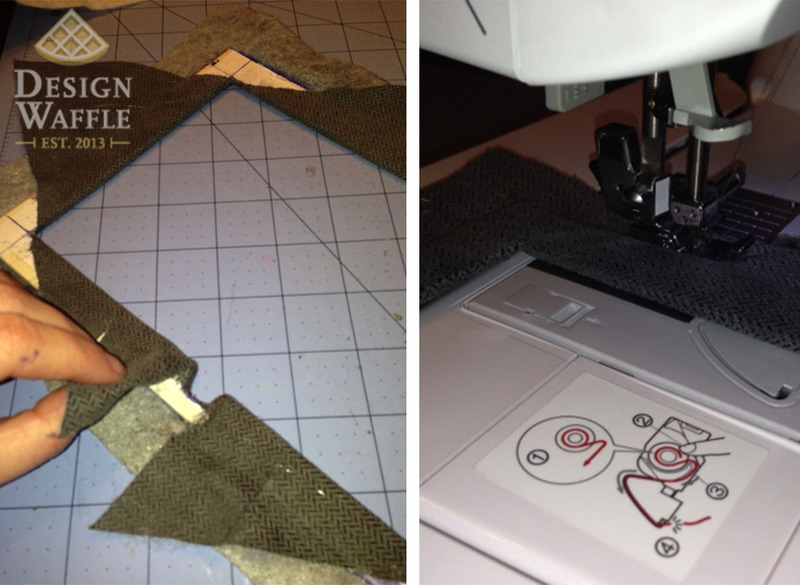 Since I had to sew over top of the board inside the cover, I couldn’t use my sewing machine. 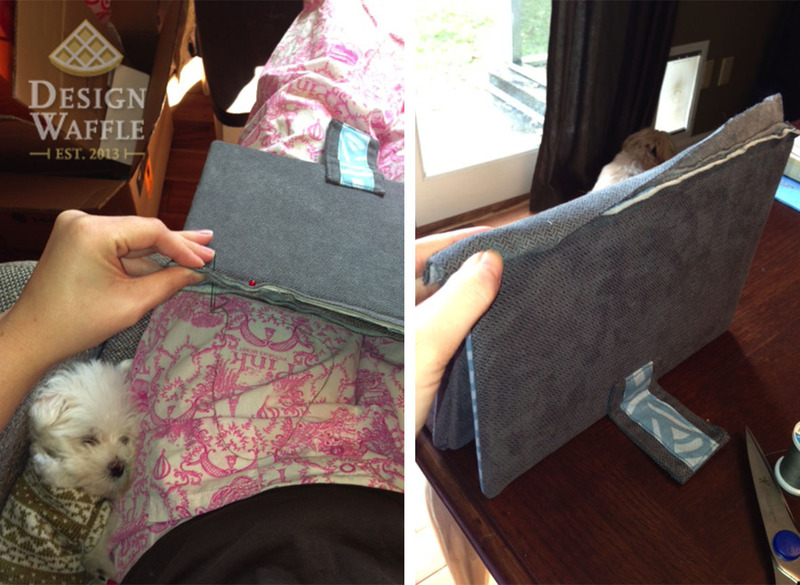 Then I sewed the inside spine piece of fabric (the grey strip of fabric shown two photos up) to the inside of the back panel. I don’t seem to have photos of these two steps. I think it was about 2am at this point so I went to bed and revisited the project in the morning. 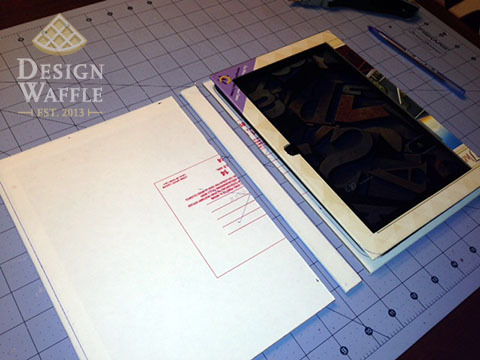 Then I pinned the front cover to the back cover to form the spine. I made sure to fit the Kindle inside so I knew how big to make the spine. I sewed on the exterior spine fabric to the exterior of the back cover but didn’t sew it on all sides. You can see that I folded it back and pinned it out of the way in the right photo above so that in a few mores steps I can secure it completely. 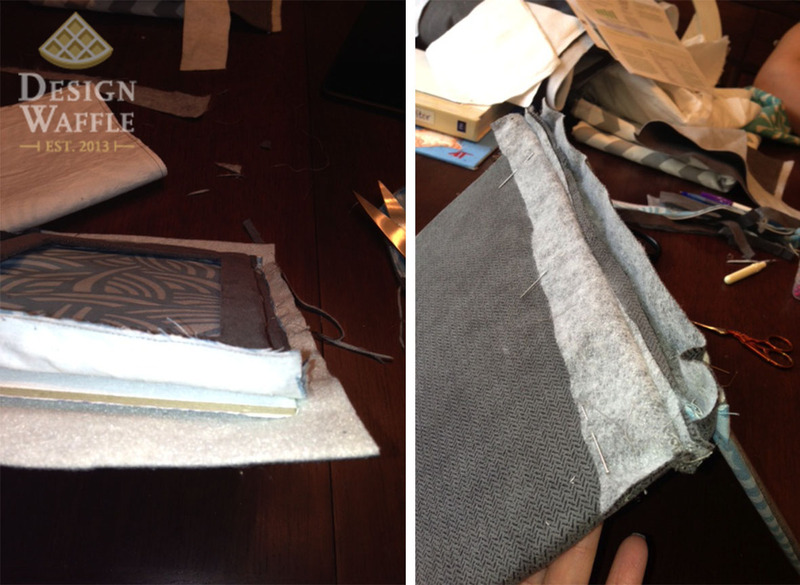 You can see in the photo below how I sewed the two covers together and then wrapped the exterior spine fabric around and sewed it in place, again by hand. The little fur ball snuggled up to me is Sam (or Kevin as some of our family calls him… long story). He’s a Maltese puppy and as sweet as can be. He belongs to my Mom, so I guess you could say he’s my brother. Weird. Then, I was ALL DONE!!! I’m shocked with the results. It looks so much better than I thought it would. 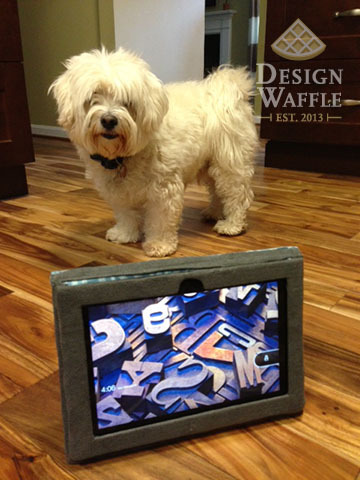 My Kindle case is even mother-appoved… and tested! 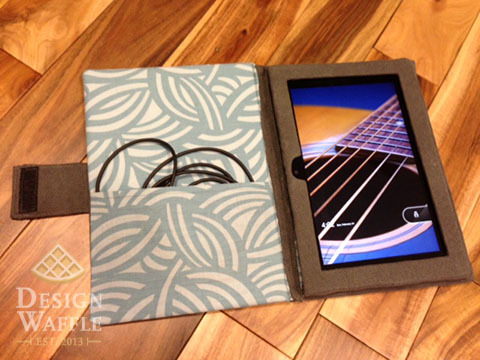 I love how the fabric is flexible enough to fold the front cover backwards for easy use. I think the case is Kimble-appoved as well. Don’t worry, he’ll be able to see it better in a few days after he visits the groomer. I can even attach the velcro strap to itself to stand the case up. 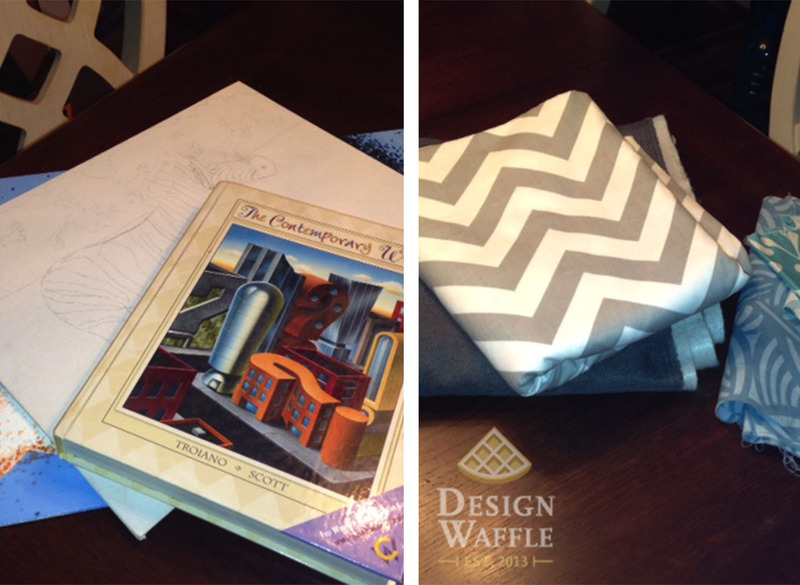 The very best part about this project, I used supplies I already had… so it was free! 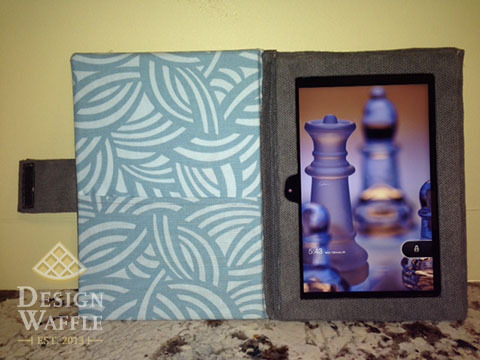 This entry was posted in DIY Projects and tagged Design Waffle, DIY, Ipad, Kindle Accessories, Kindle Case, Tablet Case, Tablet Cover. Bookmark the permalink. I’m so impressed with this project! Well done. The second best thing bout it is that nobody else in the world has one like this! Very nice! You did an excellent job. Thank you! It’s holding up pretty well too. Does this case protect it if it drops? It’s pretty tough but I haven’t dropped it yet. 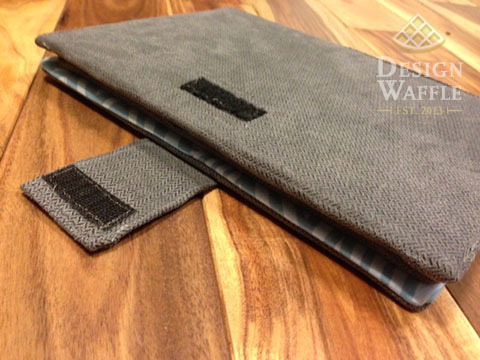 I really think it would survive a drop since its so well padded and the case is really rigid. When it gets dropped (which will happen at some point) I’ll be sure to report how it does. great job! thak you very much, it helps a lot. Thanks David! 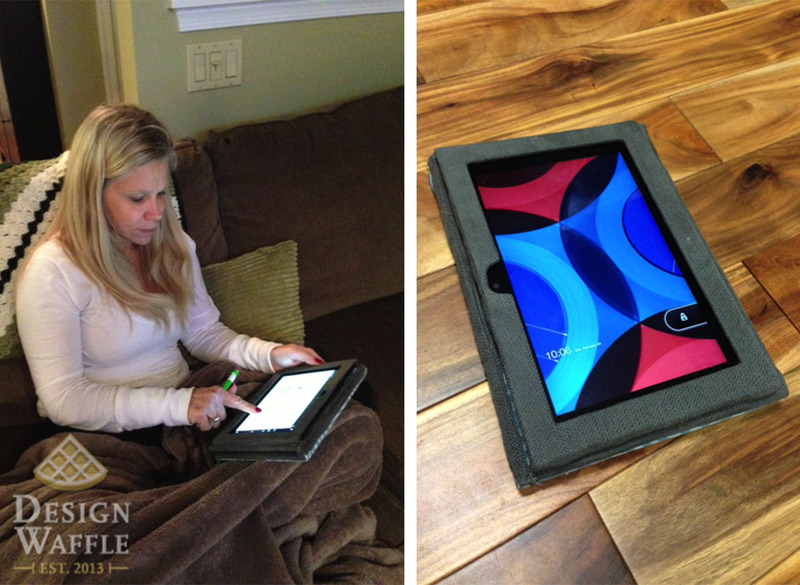 If you attempt this project, please share a photo of the finished product. I’d love to see it. I really like the concept of the window, I never would’ve of thought of that and it seemed like such a simple but dramatic difference! I’m just having a hard time following when it came to attaching the spine and back pieces, etc. I got lost in the construction process after assembling the top piece. But yours came out awesome, so jealous! 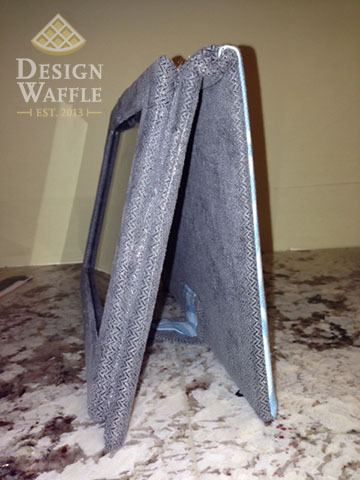 After the front and back panels were constructed, I sewed the spine on by hand. The spine consisted of two elongated rectangular pieces of fabric. I sewed the outside piece first, making sure to tuck under all the raw edges of the fabric. Then I did the same for the inside piece of the spine. I really wish I’d documented this part better! Sometimes I get caught up in the project and realize later I forgot to photograph a step. I hope I didn’t confuse you more and that some bit of help came from this! I built mine with my old pair of jeans it turned out great. You’re welcome. I’d love to see a photo! Thanks, I’m glad it worked out for you too! Thank you so much for sharing. The best I’ve seen.